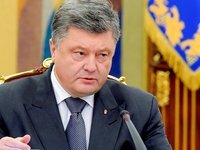 Ukrainian President and presidential candidate Petro Poroshenko has said that Crimea's return to Ukraine will be a priority if he wins the upcoming presidential election. "Immediately after the presidential elections, the first priority of President of Ukraine Petro Poroshenko will be the Crimea issue," Poroshenko said during the Freedom of Speech program aired by the ICTV television station on Monday evening. As soon as the election has been held, "the international community will immediately step up its activities to liberate Crimea by political and diplomatic means," he said. Sanctions imposed on Russia are making it pay a high price, he said. Poroshenko also said he is confident that if he wins the presidential election, talks on deploying a UN peacekeeping mission in Donbas will resume. Today, the majority of UN member countries are "ready to deploy a peacekeeping mission as a necessary component of the package of security measures to implement the Minsk Agreements," Poroshenko said. Ukraine is due to hold its presidential election on March 31.